From FAMILY GUY’s Mark Hentemann and Seth MacFarlane comes BORDERTOWN, a new animated comedy about two families living in a Southwest desert town on the U.S. - Mexico border. It takes a satirical look at the cultural shifts occurring in America, where the U.S. Census forecasts that by 2017, ethnic minorities will become the majority. Set against this increasingly diverse backdrop, the series explores family, politics and everything in between with a cross-cultural wink. BORDERTOWN centers on two clans: the Buckwalds and the Gonzalezes. 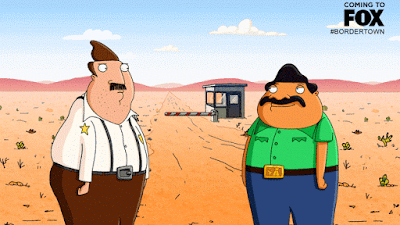 BUD BUCKWALD (Hank Azaria, THE SIMPSONS) is a married father of three and a Border Patrol agent who is just a tad behind the times and feels slightly threatened by the cultural changes transforming his neighborhood. He lives next door to ERNESTO GONZALEZ (Nicholas Gonzalez, SLEEPY HOLLOW), an ambitious immigrant and family man, who has been in the country less than 10 years, but is already doing better than Bud – which, it turns out, is a bit of an issue for the less-industrious native. Bud is married to JANICE BUCKWALD (Alex Borstein, FAMILY GUY), both the wisest and most oblivious member of the family. The Buckwald kids include BECKY (Borstein) a socially awkward, big-boned geek; SANFORD (Judah Friedlander, “30 Rock”), a loser who thinks he’s a player; and GERT (Missi Pyle, “The Exes,” “Galaxy Quest”), a beauty pageant-obsessed five-year-old with a pet pig. Meanwhile, living the American Dream next door are the Gonzalezes, including MARIA, Ernesto’s no-nonsense wife; their son, RUIZ (guest voice Efren Ramirez, “Napoleon Dynamite”); and their 21-year-old nephew, J.C. (Gonzalez), a recent college graduate. As Bud and Ernesto’s paths begin to cross, their two families soon become bound by romance, conflict and, perhaps most importantly, friendship.